Standard SiN AFM probes may have a lot of advantages for using them in your liquid cell measurements. But they also have their limits when it comes to high topographies on cells or other bio samples due to their relatively wide opening angle and the small 3µm tip height. 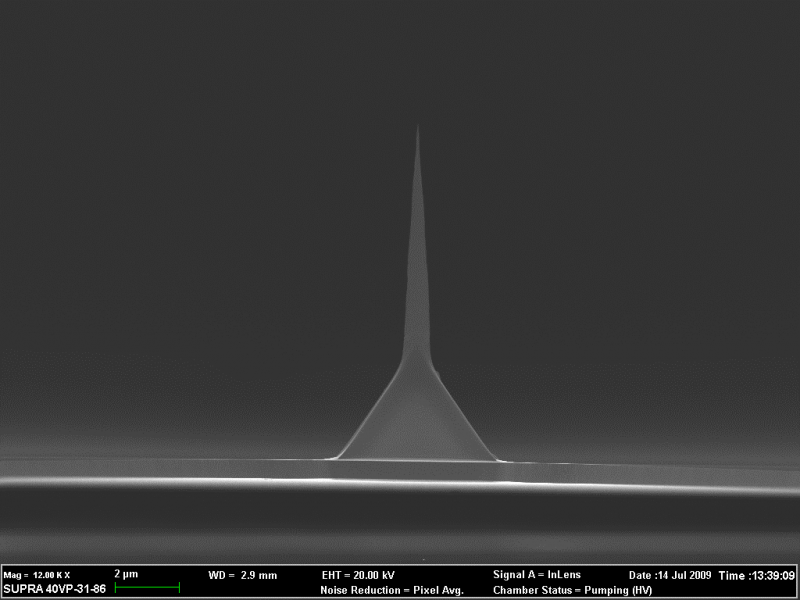 By teaming up with nanotools in Germany NANOSENSORS is able to offer you a “spiked-up” AFM tip – a silicon nitride probe with a long (10 µm) spike made of high density carbon grown on top of it – called Biotool XXL. Customized versions such as other tip lengths or other cantilevers are also possible. The screencast on the self-sensing self-actuating Akiyama Probe (A-Probe) held by Dr. Terunobu Akiyama on https://www.youtube.com/watch?v=-mrs_-soChY has just passed the 1000 views mark. Congratulations Akiyama-san! The NANOSENSORS screencast on SuperSharp Silicon AFM tips for high resolution imaging is now available in Chinese on youtube and youku http://v.youku.com/v_show/id_XOTIzNjg0NDQ0.html .